A few years ago, we were reviewing a Xiaomi mobile phone for its OTG capabilities. To be able to check whether that mobile phone connects to a flash drive or a pen drive, we had used a separate device called "OTG adapter". Had there been a dual flash drive then, we wouldn't have to buy separate adapters to convert our USB pen drives into mobile phone connecting drives as well. The main feature and advantage of a dual drive is having dual connectors on each side of the stick. On one side you would find a regular USB male connector, and on the other side you'd find a micro-USB connector that'll perfectly fit your Android phone's charging and data transfer port. The Sandisk dual drive is a flash drive that is specially designed for mobile. With a micro-USB connector on one side and a regular USB connector on the other, you can easily move files between your smartphone and your computer. Its tiny in size, weighs just 5 grams and comes with a 5-year warranty. This flash drive is USB 2.0 compliant and is perfect for backing up photos and videos on your smartphone to your computer. It is compatible with Windows Vista, 7, 8, 10 as well as Mac OS X and above. This drive also carries Sandisk's Memory Zone Android app within, that can easily be installed on your smartphone. This app allows you to backup photos and videos automatically everytime you connect it to your phone. Alternatively, you can also download this app from the Google Play Store. The price on the box for this 32GB flash drive is Rs.1150, however, you can easily buy it at a much cheaper price from various online websites. At the time of writing this article, Amazon has a lightning deal running on this product. This 32GB dual drive shows a usable capacity of 29.2GB on a computer. This is a must-have accessory for any Android smartphone/tablet owner who saves a lot of photos, videos and other documents on their phones. This is a wonderful device that lets you backup important data on the flash drive as well as free up space on the smartphone. This dual drive is rated at USB 3.0 speeds and fits the bill for someone who needs all the above features of USB 2.0 dual drive and needs speedy transfers. The dual drive m3.0 also comes in all the 4 storage options as stated above. The Sandisk Ultra dual drive m3.0 comes with a retractable design with a micro-USB connector on one side and a USB 3.0 connector on the other. The blue coloured USB connector signifies that it is indeed a high-speed USB 3.0 port. This flash drive weighs as little as 5 grams and looks classy. Sandisk also offers a 5-year warranty on your purchase. This flash drive, just like its USB 2.0 sibling, also is compatible with Windows Vista, 7,8,10 and Mac OS X and above. This dual drive is also backward compatible with USB 2.0 devices. The Sandisk Memory Zone Android app works perfectly with this device as well and allows for automatic backups whenever you connect it to your Android smartphones. The retractable design also locks the connectors (USB/micro USB) in place so that they can be easily inserted into a computer or a mobile phone. I really like the way this drive is designed. The 32GB dual drive m3.0 that I received shows a usable capacity of 28.6GB on the computer. The price on the box is Rs.1290 for the 32GB variant. However, you can easily buy it at better price from various online retailers. This 3.0 version also comes in a special gold colour edition, that may be a bit expensive than the regular black colour drive. On papers, this dual drive promises a read speed of 150MB/s. The write speeds, however, should be substantially lower. I got average read speeds of around 110-120MB/s and write speeds of around 25-30MB/s while using a USB 3.0 port on my laptop. Overall, I feel if you need to buy a regular USB pen drive for yourself, you should instead buy a dual drive that works well on your smartphone as well. This would be an added advantage for you and would help you keep backups of your important data from the computer as well as from your Android smartphone as well. Both these devices are pretty much the same, except for the transfer speeds and design. If you are looking to buy one for yourself, I would suggest you to go for the USB 3.0 version that offers a higher transfer speed at a marginally higher price. The USB 2.0 dual drive, on the other hand, comes a bit cheaper when compared and has no moving parts which may result in a longer life. 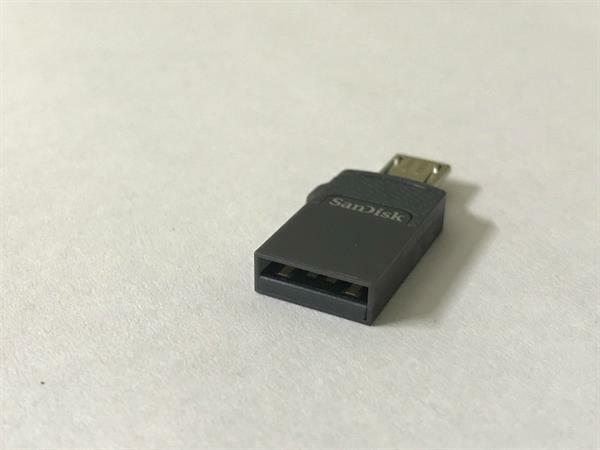 Tip: If you are an iPhone/iOS user, and are looking for something similar for your Apple devices, you can easily buy an adapter that would convert the micro-USB port on this Sandisk dual drive into a Type-C connector. I hope this article would be useful to you, please let me know in the comments section below if you have any questions on these devices, and I will try my best to answer them. While it is undoubtedly convenient, isn't it kinda slow though? 8 MB/s is pretty slow in comparison to similar size, but less convenient drives.